Magic Affair was formerly known as the Mysterious Art project (M.A.!). Mike Staab produced this band’s hits like Omen and Karma (Omen II) which were created around a camp fire, on a Friday 13th. Omen entered Top 100 on May 13th 1989, and reached #1. It was at place #2 for the whole 1989 year (right after Kaoma’s Lambada). At this time, the project was made of Nicole Boeuf, Stephanie Trautmann, Michael Krautter and Tillmann Uhrmacher. Omen II had the same success a year later. 2 albums were released, Omen – The Story in 1989 and Mystic Mountains in 1991. 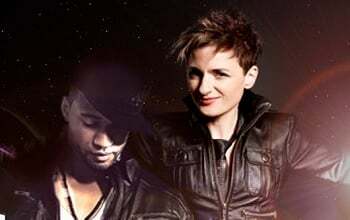 The project Magic Affair was created in 1994 with the singer Franca Morgano and the rapper AK Swift (rap) after auditionning 3 rappers and 5 singers. Successful in less than 2 years, Magic Affair climbed from highlight to highlight. They sold numerous of records and they had many chart-triumphs all over the world. The first song Omen III reached number 1 in the German chart six weeks after the being on the market, and top 10 in several other countries. For instance it was # 5 in Israel, # 9 at MTV, and # 18 in UK. The video was on high rotation on TV channels like VIVA, MTV, Disney, DSF and RTL. The single sold gold and platinum in Germany, gold in Austria. The follow-up Give Me All Your Love entered top 40 in UK, top 5 in Germany (it reached # 7 on the German charts), and reached # 6 at MTV. It sold gold once again in Germany and won the prestigous Echo Award in 1995 for the ”single of the year”.